Posted 12 January 2014 & filed under 1930s, Agriculture, Betty Terry, Life and leisure, Places and spaces, Work. Mrs Giddings, Betty Terry’s mother, worked at St Julian’s farm for the Muir family. Betty remembers hunting for mushrooms there. She also remembers an airfield behind the farm where you could get a flight for 10 shillings. Interview date: 20 May 2010. Interviewer: Sandy Norman. 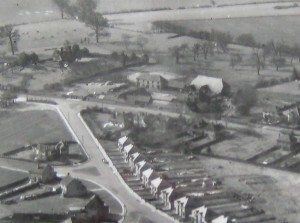 The airfield referred to by Betty was presumably St Julians Aerodrome, a short-lived enterprise which was brought into use on 14 January 1933 by the County Aviation Company and used by the Hertfordshire Flying Club. It closed eighteen months later in July 1934, probably due to the proximity of Handley Page’s Radlett Aerodrome. It did, however, manage to host an appearance of Sir Alan Cobham’s National Aviation Day display (Flying Circus) on 24 May 1933. The aerodrome was situated on land which is now part of Marlborough School’s playing fields, at grid reference TL140055. St Julians Farm was also known as Muirs Farm. Spent many happy hours playing in the big farmhouse, on the left of the barn, with Fergus the farmers son. Fergus had a huge ‘O’ gauge model railway layout in one of the big bedrooms. We also used to take picnics, packed by his Mum, down to the cherry trees and sit on a old dilapidated two wheel cart to eat them. Just inside the entrance was a pig sty which usually housed a big porker.